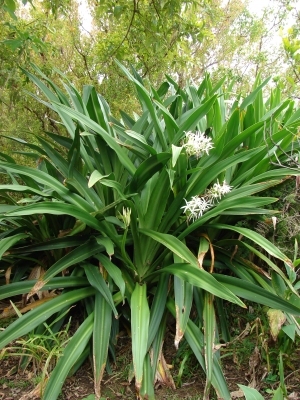 Crinum angustifolium Herb. Ex Steud. Crinum brevilimbum Carey ex Herb. Crinum floridum Fraser ex Herb. Crinum plicatum Livingstone ex Hook. Crinum sinicum Roxb. Ex Herb. Crinum umbellatum Carey ex Herb. E. Asia - Indian Ocean throughout most of tropical Asia to Australia, Samoa and Vanuatu. Excellent guide to 102 medicinal herbs of the Pacific Islands, with photographs of each plant and details of their constituents, biological activities and traditional uses. A description of each plant, together with habitat and distribution is given. Seed - best sown as soon as it is ripe, placing 2 - 3 seeds in individual pots. Do not cover the seed. Once they have germinated, you can thin each pot to just one plant if required, though we have not found this to be necessary. Give an occasional liquid feed to ensure that the plants do not suffer nutritional deficiencies. Grow them on until large enough to plant out. Division of offsets when the plant is dormant.